On May the 12th 2015 Facebook has officially launched their so called Facebook Instant Articles. Instant articles are designed to quickly load content right from within Facebook, loading on average 10x faster than the typical website link. This makes them super useful and powerful for publishers and marketers. Why is that? Speed matters! Even as little as a 1 second delay can result in a 7% drop of conversions! This is especially important as social media and in particular Facebook is primarily accessed via mobile. In fact 90% of daily users access Facebook via mobile! This also means, that internet speed, although getting better and faster every year is still slower than on desktops. This means, if you are out there trying to sell something focus on speed first! 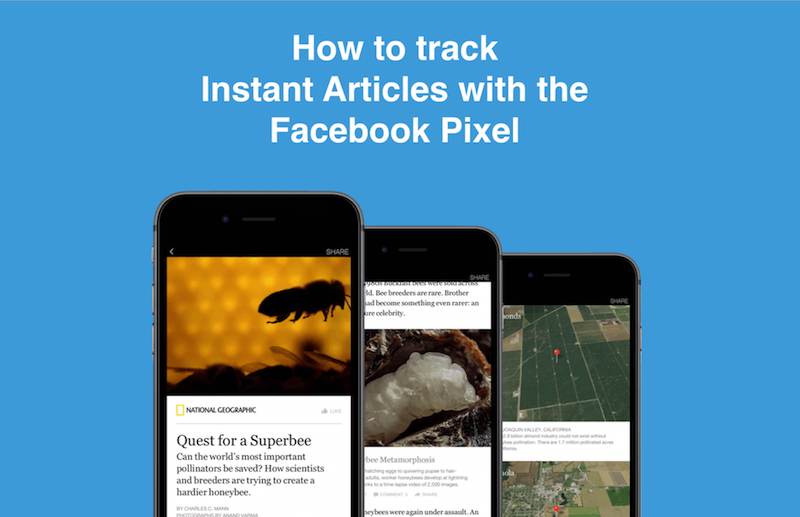 If you are already using Instant articles and want to know how to set up the pixel tracking, then scroll further down! If you want to learn how to set up Facebook Instant articles then read on from here. What are Facebook Instant Articles and how do they work? Facebook Instant Articles is a mobile publishing format that allows publishers of all kind to deliver their content through the Facebook servers and publish it to the Facebook app. 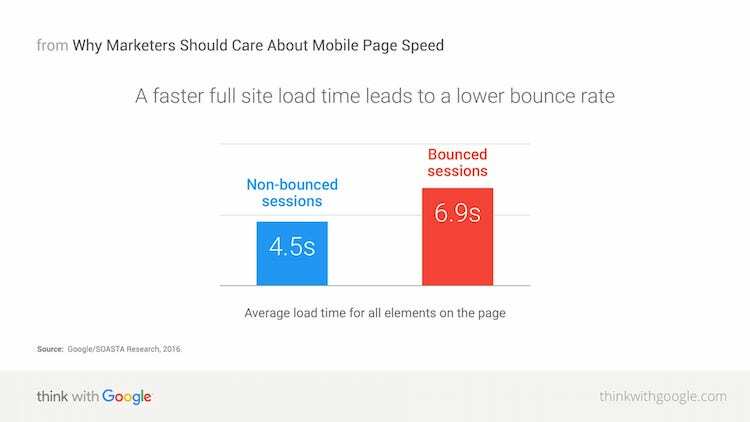 With Instant Articles content loads on average 10x faster than the “normal” mobile web. So how does that work? Basically Instant articles is a stripped down HTML5 document format, that gives you some room for styling and branding. Instant articles are mobile optimized and apply a standardized markup, that can be added automatically, which again allows you to easily scale your process of article creation. When you use Facebook Instant Articles, you kind of give up control of your content. Instant articles are not hosted on your domain, like usual content but are hosted on Facebooks’ servers.That fact has of course it’s up and downside. The positive aspect of that is, your content is loading extremely fast. I mean, no wonder, Facebook is spending $860 million per year to deliver its content at that speed! The downside, is that you are giving up control. When I talk about control, it does not mean, that someone is going to hijack your content, but instead you won’t be as free as on your own website to add styling or lead capture elements. So it depends on you, and your business model which factor is more important to you. How to setup Facebook Instant Articles? Alright now we know, what Instant Articles are and how they work. Let’s have a look at how you can set them up. Navigate to the publishing tools tab, located on your Facebook page and click on it. 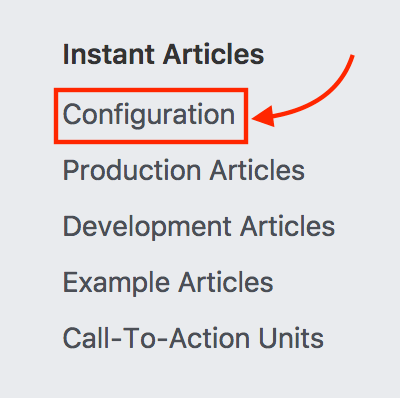 On your left navigation you need to scroll down until you find the section called “Instant Articles”.Then click on configuration. The first thing you need to do, is to connect and verify your website. To do this, you need to add a short meta tag to your <head> section on your website. Optionally, if you are using wordpress, you can also add the connection ID via the official plugin. Instant Articles are great, because they allow you to transform your self hosted blog posts automatically into instant articles. All you need to do, is add the RSS feed of your blog. You can choose between the development and production feed. While the publishing feed is the real deal, the development feed, allows you to test on scale. Style your articles. Instant Articles come with a default theme. However if you’d like to give your articles some style, so that people can recognize your brand, you can do so as well. To add a custom style to your articles, you need to navigate one section down and then click on “Add Style”. Now in your styling section you are able to edit fonts, text sizes, paddings colors and more. Try to make your Instant Article look as similar as possible like your blog. This will give people a homogenous feeling and they will feel more connected to your brand. That’s all you have to do, to get started with Instant Articles. Before you are able to publish your newly created articles, Facebook will need to review them which can take up to two business days. In most cases it is done within a couple of hours. Are Instant Articles conversion optimized? More or less. 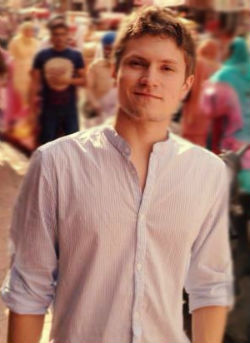 Being conversion optimized depends on quite a lot of different factors! And one major one of those factors is speed. Well, and as mentioned above in speed instant articles really excell! But that’s of course not it. 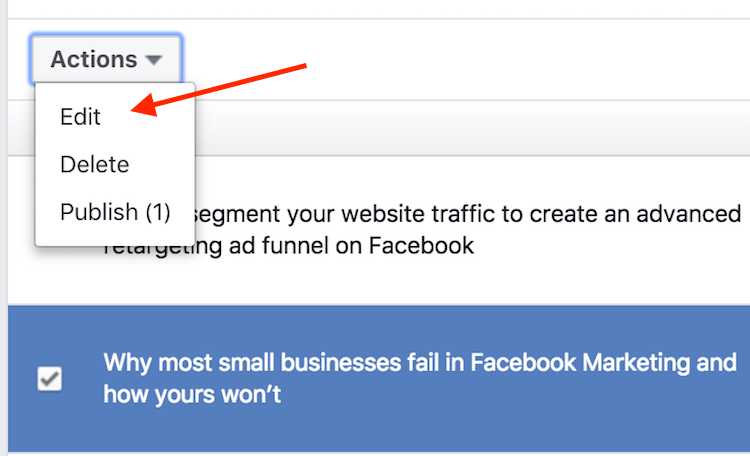 To be conversion optimized you need to be able to ask for a lead properly and although Facebook added some options, they are only suboptimal so far. In fact, you only have two options of lead capture right now! Either ask for a like of your fan page or ask for an email signup. Here is how they look like in action. The like capture is quite sleek. And it makes quite a lot of sense, if you are writing a lot of content, that is directed to create awareness. The lead capture can be modified and changed in appearance and text. It is great to capture leads for your newsletter or additional information you want to follow up with via email. Let’s have a look how you can add both the CTAs to your Instant Articles. Navigate to your Facebook page and locate your “Publishing Tools” tab.Click on it. On your left navigation bar you want to scroll down until you see the Instant Article section again. 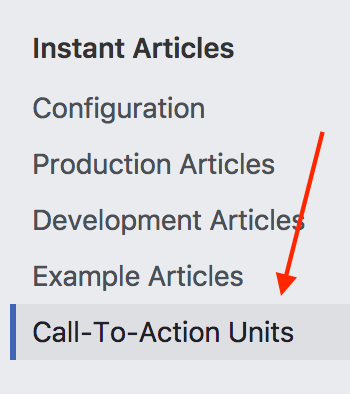 This time you want to click on “Call-to-Action Units”. Now you are on the CTA overview section. Next you want to click on the create a new call to action unit button, in the top right corner. In the following pop-up you can select the CTA you want. You can choose between Page Likes and email leads. In this case we are going to create a lead capture. You don’t really have a lot of space to customize your lead capture. However you can modify a couple of different things. Such as the headline, background color and body text. You can also add your logo, to brand the CTA a little bit. Once you have styled and added all the information you want to the lead capture. Hit the save button and publish the form. On the CTA overview screen you can get insights on the performance of each unit and edit them. 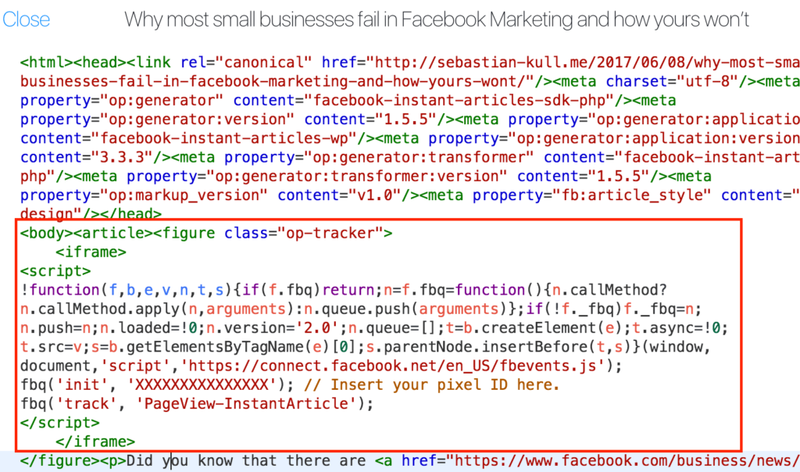 Facebook Instant articles luckily don’t leave you blind, instead they come with some basic tracking options built in. The insights that come with the articles are somewhat just very basic and I have to admit, quite unsatisfying. To get those insights you will need to go back to your production article overview. Once you see all your articles, you can click on each article to get more insights about the user behavior. The metrics, that are currently tracked are article views, time spent on article and scroll depth. And that’s already that. Further you are also able to integrate Google Analytics with your Facebook Instant Article. 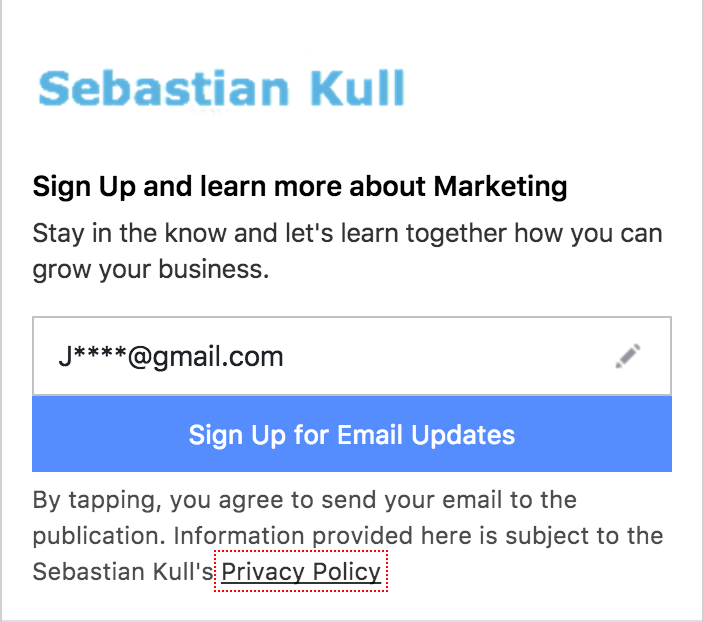 To do this Facebook offers the option to embed third party tracking through an iframe, within the <body> tag of the article. Go to your Google Analytics tool and navigate to your Admin overview and click on tracking info. 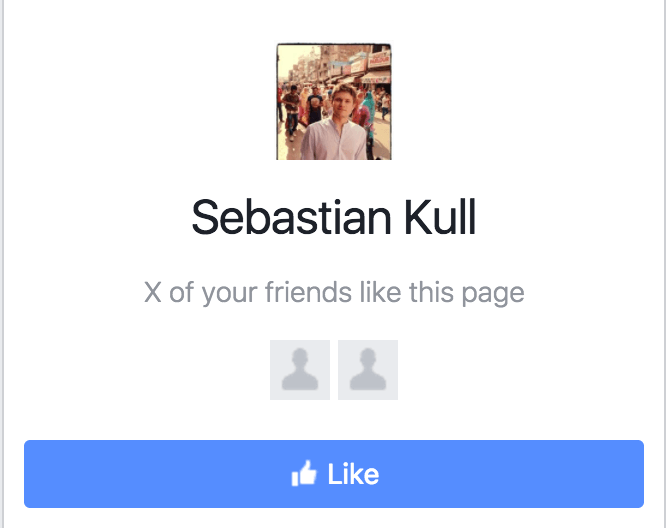 Then, copy your tracking code and head over to your Facebook page’s publishing tools. Next, click back on your production articles and click on edit. Now you are able to add some custom code within your articles. All you have to do, is add your Google Analytics code within the following iframe snippet within your <article> tag. Now, by default your traffic recorded in Google Analytics will appear as direct traffic. But that is of course not what you want to see in your analytics records. Luckily, we are also able to modify that and change the traffic source of Instant Articles Traffic. You can change the default referral settings to the source you would like. I have been using “Facebook-Instant-Articles” as my custom source name. This is already great news, however Facebook does not allow us to track even further article interaction through our third party tool, as the tracking code is being sandboxed within the iframe. How to track Instant Articles with the Facebook pixel? At first when I was using Instant Articles for the first time, I assumed that Facebook would automatically record all visit sessions with the Facebook pixel and simply show them as regular pageviews. However after monitoring my traffic in Facebook Analytics for some time, I realized something was wrong. 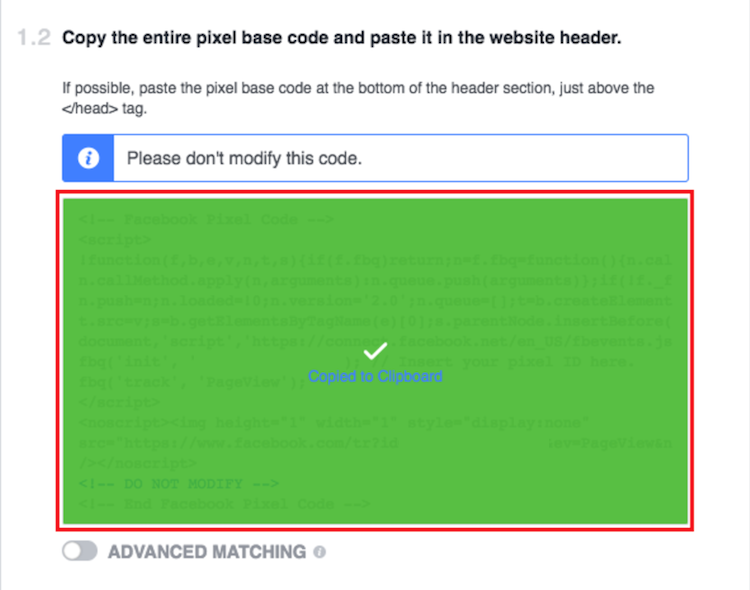 So I searched the web and found nothing except an official Facebook support answer, that it is currently not possible to track Instant Articles with the Facebook pixel. Damn! What’s the point of pushing out super fast content on Instant Articles if you are not able to track and create audiences from it? After reading all the Facebook documentation thoroughly I started to play around with the code and damn, it was much easier than I thought! So, here is how you can actually track your Instant Articles with the Facebook pixel. 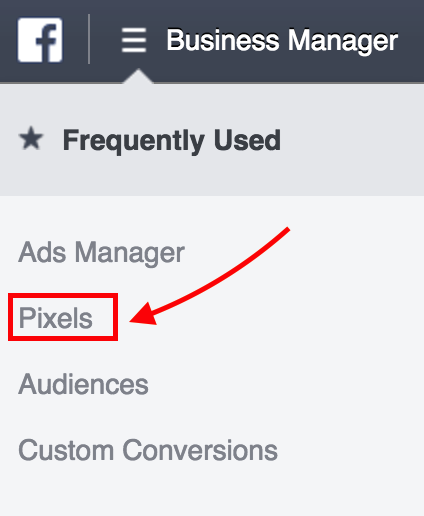 Go to your Facebook business manager and navigate to your pixel overview. Then click on view your pixel. Copy your Facebook pixel, and paste it into a notepad or Google doc. Next, give your pageview tracking a different name, so you are able to easily identify if your tracking is working and also measure the real visitor impact on your Instant Articles. I called mine simply “PageView-InstantArticle”. Now, it’s time to head over to our Instant Article section within our publishing tools. Then click on your production articles and select one, that you want to push live and click on edit. 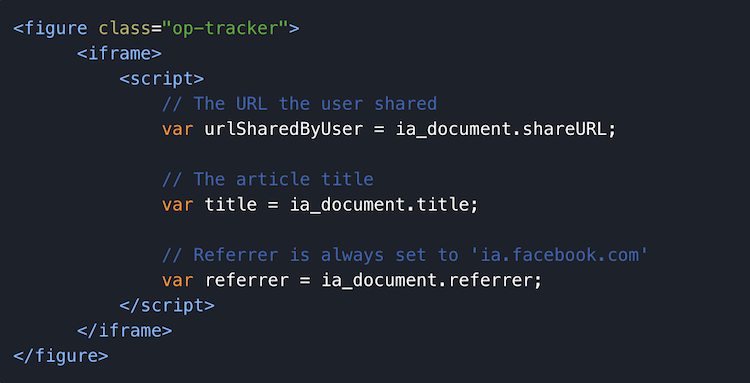 Within your Instant Article, we add an iframe code snippet with the figure class op-tracker, similar to when you want to add Google Analytics, as you can read above. 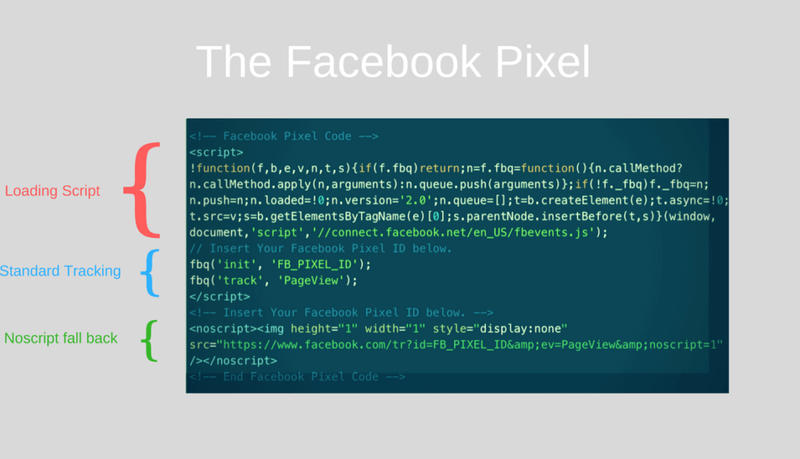 Within this iframe, we simply add our Facebook pixel script snippet. After you have added the pixel snippet, click save. Then in the articles overview, hit publish and open your mobile Facebook App. Refresh your app and go to your fan page and open the instant article you have just published. Next, you will need to wait for a couple of minutes and then go back to your pixel overview within the your Facebook business manager. After refreshing the view, you will be able to see your new pageview event. And voila, you have successfully implemented your Facebook pixel in your Instant Articles. By doing so you are able to track and measure how many people are actually reading your articles and you are able to create new custom audiences based on your Instant Article visits. Should you use Facebook Instant Articles today? I have been testing Instant Articles for some time now. At first I thought it is awesome and great. Because, what can I say, it is extremely fast and smooth! The user experience for consuming content is really great. By implementing the Facebook pixel I was also able to create audience out of readers and track engagement. Of course I have been also trying the Lead capture elements of Instant Articles. But here comes my but! Although I love the blazing fast speed and the smooth loading transition I have been switching back to my normal website for now. Why is that? I tested both and I saw an increase of 30% in leads by directing traffic back to my website. Simply because Instant Articles are not yet designed for marketers but rather for big content publishers such as newspapers or magazines. Lead capture is not as simple there, which I also consider a minus for the end user. Because in the end when you capture a lead or acquire a new customer, you are providing value. With Instant Articles that is just not possible in the same way. So I believe you are missing out. If you haven’t been using Facebook Instant Articles so far, I recommend you go ahead and test it for yourself! 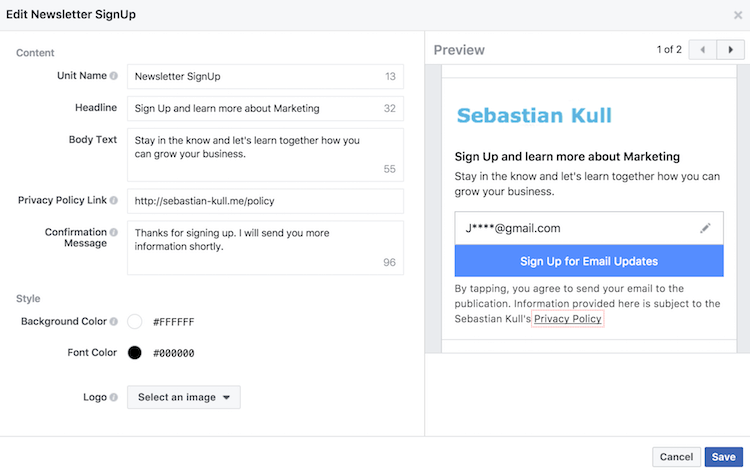 Although I have been switching back to my website for now, it probably won’t be too long that Facebook is going to add some more advanced features for marketers. So I think the earlier you make your first experiences with using Facebook Instant Articles the better. 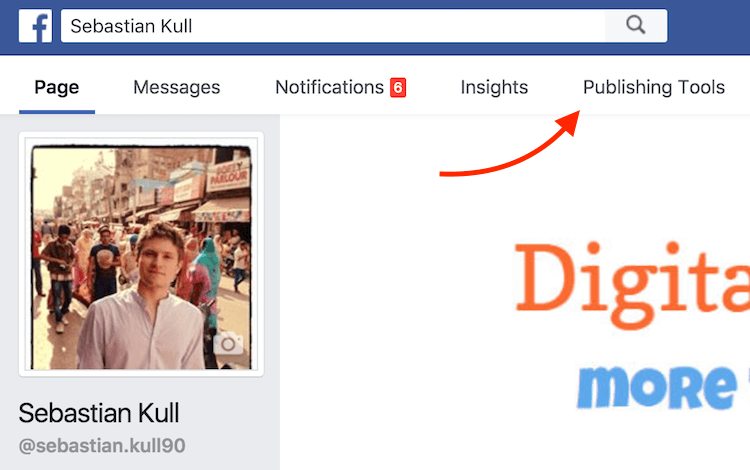 I also recommend that you follow my Facebook pixel installation “trick” in order to create custom audiences and track engagement of your articles correctly. The default tracking is great but far from perfect. I hope you liked this article, let me know what your experiences with Facebook Instant Articles have been in the comments below and if you found another way of tracking even more information with the Facebook pixel!